Been keeping busy on the cross stitch project but had to take a brief detour to figure out a better way to store my floss. I had acquired quite a bit in anticipating the needs of this project and found that the old way of storing it wasn’t going to work (and was taking up way too much space on the ottoman). While out running errands this weekend, happened to drive by my local Micheal’s store and saw that they had photo/memory boxes on clearance. 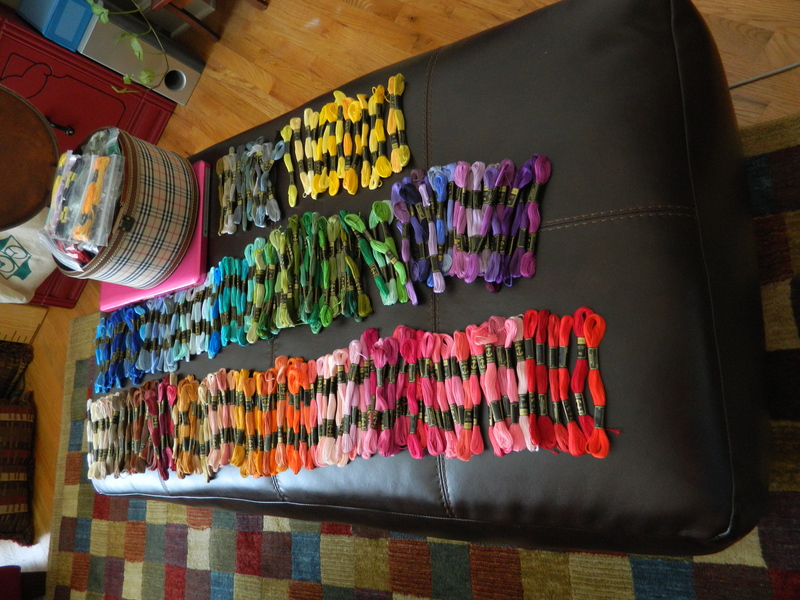 I guess the new colors and designs are about to come in so it was time to clear out the remaining inventory. 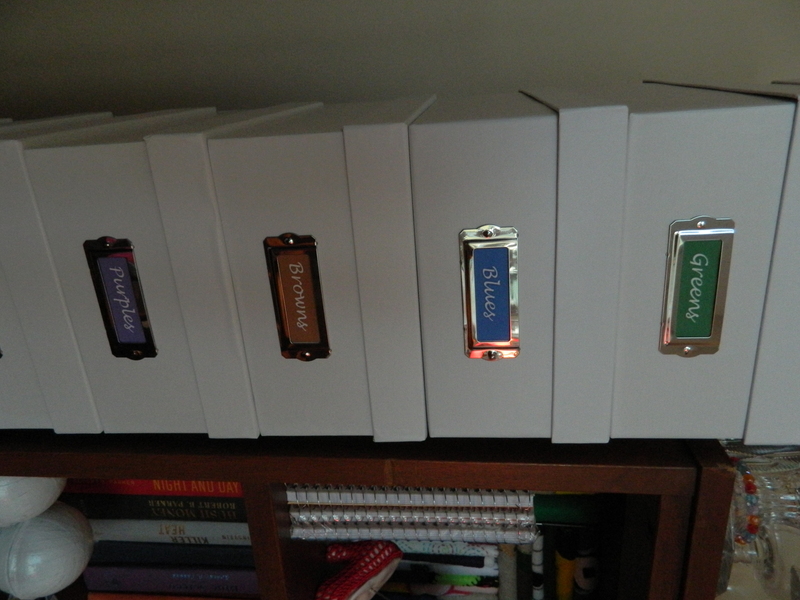 At two bucks apiece, I bought all the all-white boxes they had – 15 in all. I believe in planning ahead. I jumped onto the computer quickly and made up some labels in Photoshop. Not sure that the final font is my favorite but I will go with it for now. 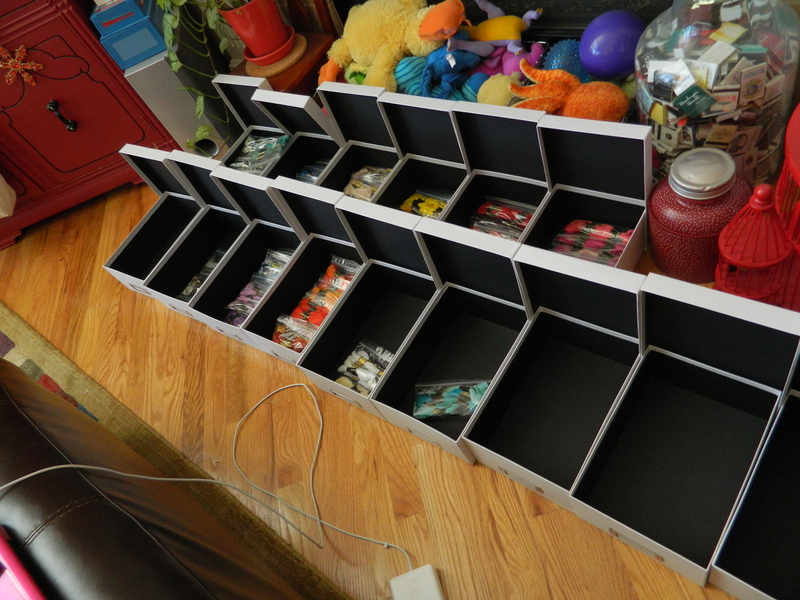 I lined up the boxes on the floor and sorted colors into the boxes. Believe it or not, there are some empties (I am sure that I have to rectify that problem!). 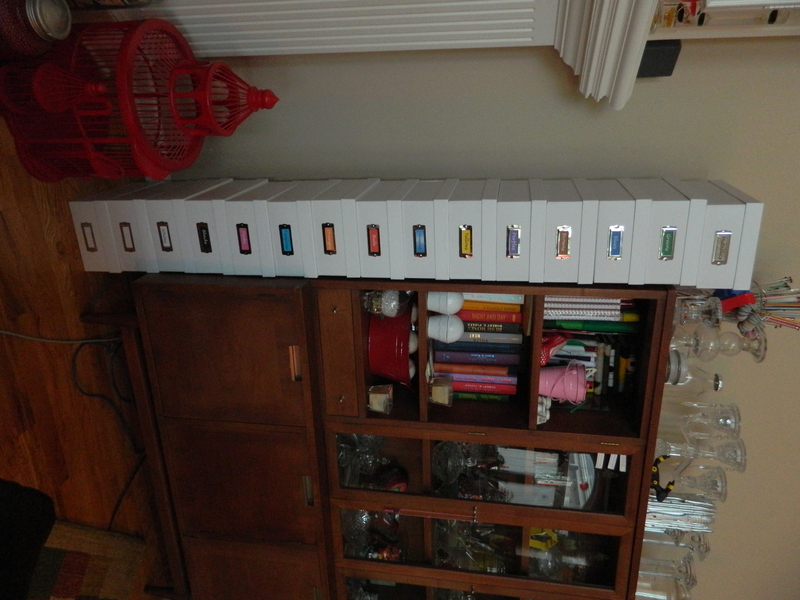 Then I inserted the color labels and then stacked them up next to one of the two crafting cabinets I have in the living room… I kind of like the way they look. Nice and clean. I think I’d like some kind of platform to bring the bottom one off the floor. And might take the two bottom boxes out since they aren’t currently being used and lifting them off the floor would make the stack a little too high. Well, back to the cross stitch project. See you soon! Started a new job a couple of weeks ago and have been busy getting myself integrated there. But I have some time now and thought I’d share with you my current project-in-process. I had a friend share with me an artist’s work and I have totally fallen in love with it. 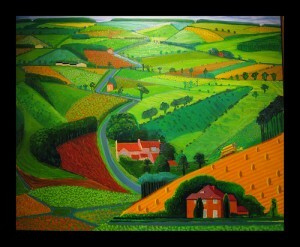 The artist is David Hockney (here is his website). His style speaks to me, as does his use of vivid colors and broad brush strokes. The painting that really captured my heart was one in a series of landscapes from the late 90’s. 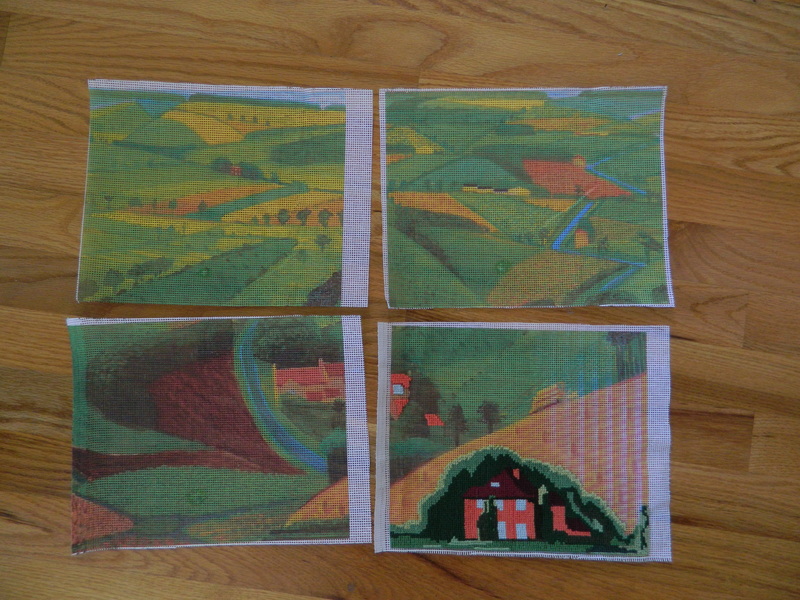 It is called ‘Yorkshire Landscape’ (1997). So, I decided to replicate this painting as a cross stitch. Of course it has much too much detail if I tried to do this in an 8 1/2 x 11″ size… I would just lose all of what I love about it. 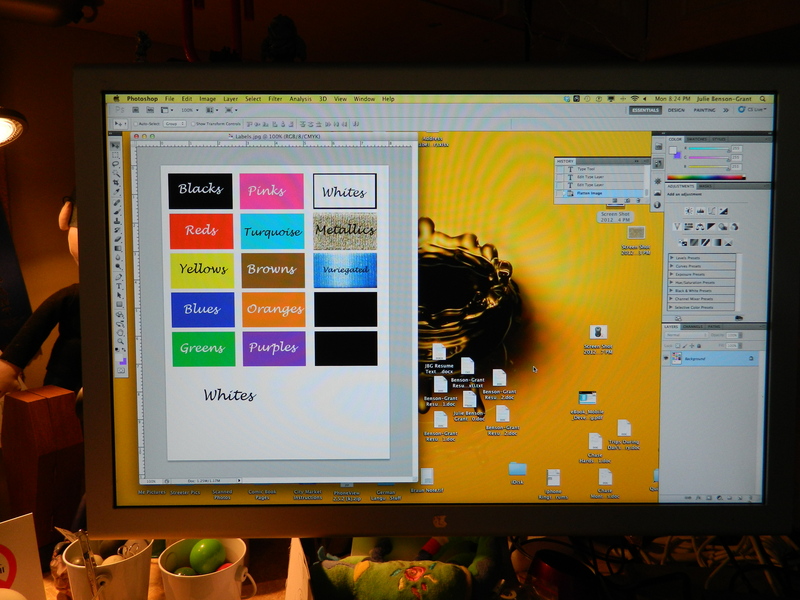 So I found a good clean image of it and opened it in Adobe Photoshop, increased the size to the final size I wanted – essentially four 8×10″ sizes – and saved it. Then I had to divide it into four individual sections for printing (I’ll explain further in a minute) keeping in mind some small overlapping sections. I’ve never gotten the hang of counted cross stitch, so I always opt for printed canvases. But one is pretty limited in what is out there for pre-printed canvases and it does limit the personal aspect of what someone might want to do. So, I spent some time figuring out how to print on the canvas using my personal computer and an inkjet printer. I purchased some cross stitch fabric at my favorite store (Joann’s Etc.) which comes in a big sheet of 20″ x 36″. It’s nice and stiff and realized early on that it could be run through my printer. Printing with just a slight overlap of the image on each paper-sized piece of the canvas would allow me to ‘stitch’ the pieces together when I completed them. This gives me the ability to make much larger canvases. I already owned a fair amount of embroidery thread which I use for doing cross stitch as well, but found very quickly that this is going to take a lot to complete. 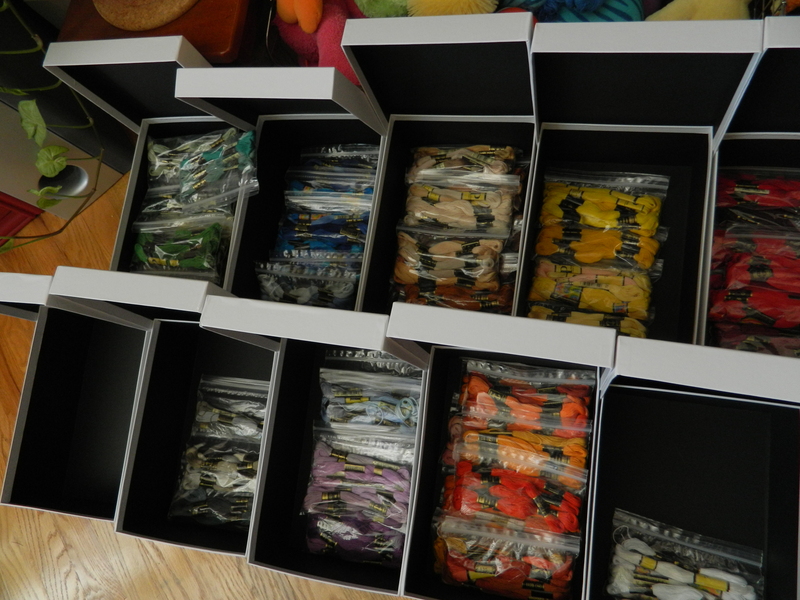 My original stash is what is in the hat box in the upper right hand corner, but after dropping nearly sixty dollars on shades of green thread at my local Hobby Lobby, I quickly turned to eBay for my next purchase, which is sorted here. It is a brand from England, called Anchor, and it came really fast. 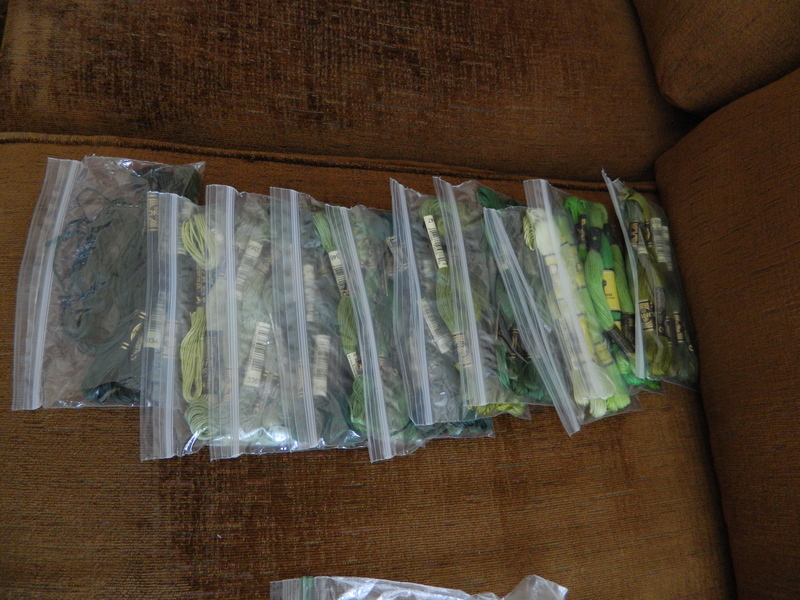 Here is part of the sorted greens… this particular project is going to take a LOT of green. I still have some detailing to do around the windows and in the trees, but think I will do that as each canvas is completed. 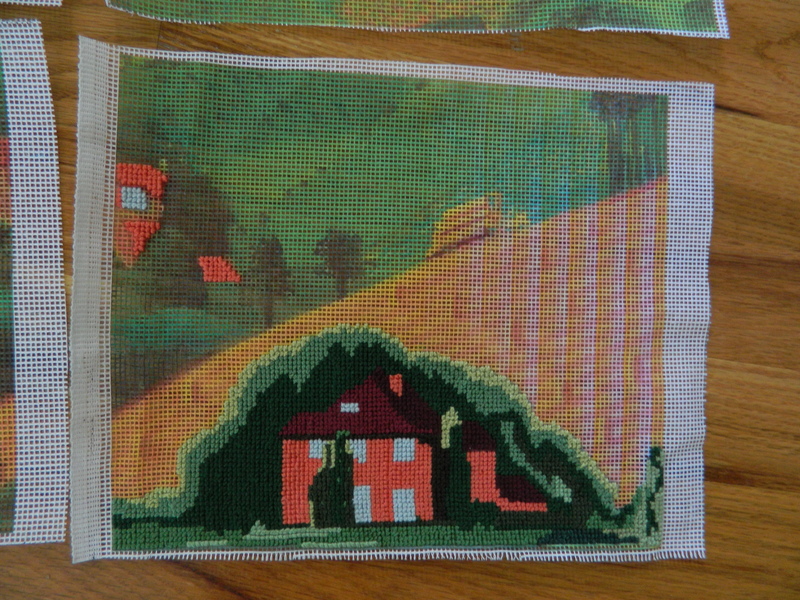 I do think I need to acquire a lot more orange and gold thread for this next field of grains. I’ll provide more updates and photos as I work through this. I am determined to not let this become an unfinished project. About a year ago when my interest in cross stitch was renewed, I dug through my supplies and found a canvas that I had started when a good friend had a baby girl. It was about 90% done, so I sat and finished it. That baby girl is now a freshman in college. Well, thanks for dropping by. Share with me stories or photos of your projects. I love to see what others are working on!